Own My Little Pony - Panels Mug from Deff, DVD, Blu-Ray & 4K Video Specialists - Free UK Delivery..
Own My Little Pony - Pony Pattern Notebook from Deff, DVD, Blu-Ray & 4K Video Specialists - Free UK Delivery..
Own My Little Pony - Retro I Want A Pony Mug from Deff, DVD, Blu-Ray & 4K Video Specialists - Free UK Delivery..
Own My Little Pony - Retro Please Wipe Your Hooves Doormat from Deff, DVD, Blu-Ray & 4K Video Specialists - Free UK Delivery..
Own My Little Pony - The Movie Blu-Ray from Deff, DVD, Blu-Ray & 4K Video Specialists - Free UK Delivery..
Own MLP Equestria Girls - Friendship Games / Rainbow Rocks / Legend Of Everfree DVD from Deff, DVD, Blu-Ray & 4K Video Specialists - Free UK Delivery..
Own MLP Equestria Girls - Legend Of Everfree DVD from Deff, DVD, Blu-Ray & 4K Video Specialists - Free UK Delivery..
Own MLP Equestria Girls - Tales of Canterlot High DVD from Deff, DVD, Blu-Ray & 4K Video Specialists - Free UK Delivery..
My Little Pony – Friendship Is Magic Season 4 Volume 4, containing the following fun-filled episodes: Leap of Faith: A miracle, cure-all tonic has Ponyville ponies eager to spend their hard earned money for a chance to be rid of their ailments. Applejack has her doubts about the merits of the tonic, until Granny Smith begins taking it and appears to be cured of all her aches and pains. 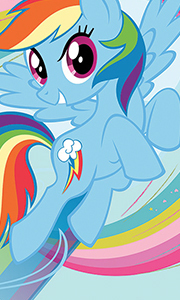 Testing, Testing, 1, 2, 3: Rainbow Dash is preparin..
Own My Little Pony - A Canterlot Wedding DVD from Deff, DVD, Blu-Ray & 4K Video Specialists - Free UK Delivery..
Own My Little Pony - A Dash of Awesome DVD from Deff, DVD, Blu-Ray & 4K Video Specialists - Free UK Delivery..
Own My Little Pony - Always Awesome Mug from Deff, DVD, Blu-Ray & 4K Video Specialists - Free UK Delivery..
Own My Little Pony - Apple Jack DVD from Deff, DVD, Blu-Ray & 4K Video Specialists - Free UK Delivery..
Own My Little Pony - A Rootin Tootin And A Hoofin DVD from Deff, DVD, Blu-Ray & 4K Video Specialists - Free UK Delivery..
Own My Little Pony - Baby Cakes DVD from Deff, DVD, Blu-Ray & 4K Video Specialists - Free UK Delivery..
Own My Little Pony - Blame It On The Sugar Mug from Deff, DVD, Blu-Ray & 4K Video Specialists - Free UK Delivery..
Own My Little Pony - Call Of The Cutie DVD from Deff, DVD, Blu-Ray & 4K Video Specialists - Free UK Delivery..
Own My Little Pony - Equestria Girls Rainbow Rocks / Friendship Games DVD from Deff, DVD, Blu-Ray & 4K Video Specialists - Free UK Delivery..
Own My Little Pony - Equestria Girls Specials DVD from Deff, DVD, Blu-Ray & 4K Video Specialists - Free UK Delivery..
Own My Little Pony - Fall Weather Friends DVD from Deff, DVD, Blu-Ray & 4K Video Specialists - Free UK Delivery..
Own My Little Pony - Fluttershy DVD from Deff, DVD, Blu-Ray & 4K Video Specialists - Free UK Delivery..
After learning that she is part of the Elements of Harmony, studious unicorn Twilight Sparkle is sent by her mentor, Princess Celestia, to Ponyville to study the magic of friendship. There she meets Rainbow Dash, Applejack, Rarity and Fluttershy. In all their adventures together, the ponies learn important lessons. Episodes: Cutie Markless Part 1 Cuties Markless Part 2 Castle Sweet Castle Bloom and Gloom Tanks for the Memories Appleo..
Own My Little Pony - Games Ponies Play DVD from Deff, DVD, Blu-Ray & 4K Video Specialists - Free UK Delivery..
Own My Little Pony - Griffon The Brush Off DVD from Deff, DVD, Blu-Ray & 4K Video Specialists - Free UK Delivery..
Own My Little Pony - Heart Mug from Deff, DVD, Blu-Ray & 4K Video Specialists - Free UK Delivery..
Own My Little Pony - Magical Tales DVD from Deff, DVD, Blu-Ray & 4K Video Specialists - Free UK Delivery..
More fun filled frolics with everybody s favourite ponies. When Pinkie Pie s big sister Maud comes to town, her friends have trouble summoning up any enthusiasm for the rock solid rock scientist. Then things go from bad to worse when Sweetie Belle ruins a dress Rarity has made for Pop Pony Saphire Shores and Granny Smith falls for the latest con of slippery sales ponies Flim and Flam when they sell her a rejuvenating tonic, that could e..
Own My Little Pony - May The Best Pet Win DVD from Deff, DVD, Blu-Ray & 4K Video Specialists - Free UK Delivery..
Own My Little Pony - My Pony Party DVD from Deff, DVD, Blu-Ray & 4K Video Specialists - Free UK Delivery..
Own My Little Pony - Owls Well That Ends Well DVD from Deff, DVD, Blu-Ray & 4K Video Specialists - Free UK Delivery..
Own My Little Pony - Party Animal Mug from Deff, DVD, Blu-Ray & 4K Video Specialists - Free UK Delivery..
Own My Little Pony - Pinky Pie Party DVD from Deff, DVD, Blu-Ray & 4K Video Specialists - Free UK Delivery..
Own My Little Pony - Princess Twilight Sparkle DVD from Deff, DVD, Blu-Ray & 4K Video Specialists - Free UK Delivery..
Own My Little Pony - Rarity Takes Manehattan DVD from Deff, DVD, Blu-Ray & 4K Video Specialists - Free UK Delivery..
Own My Little Pony - Sonic Rainboom DVD from Deff, DVD, Blu-Ray & 4K Video Specialists - Free UK Delivery..
Own My Little Pony - Spooktacular Pony Tales DVD from Deff, DVD, Blu-Ray & 4K Video Specialists - Free UK Delivery..
Own My Little Pony - The Best Gift Ever Christmas Special DVD from Deff, DVD, Blu-Ray & 4K Video Specialists - Free UK Delivery..
Own My Little Pony - The Crystal Empire DVD from Deff, DVD, Blu-Ray & 4K Video Specialists - Free UK Delivery..
Own My Little Pony - The Movie DVD from Deff, DVD, Blu-Ray & 4K Video Specialists - Free UK Delivery..
Own My Little Pony - The Return Of Harmony - Limited Edition DVD from Deff, DVD, Blu-Ray & 4K Video Specialists - Free UK Delivery..
Own My Little Pony - The Return Of Harmony DVD from Deff, DVD, Blu-Ray & 4K Video Specialists - Free UK Delivery..
Own My Little Pony - The Show Stoppers DVD from Deff, DVD, Blu-Ray & 4K Video Specialists - Free UK Delivery..
Own My Little Pony - Totally Awesome Mug from Deff, DVD, Blu-Ray & 4K Video Specialists - Free UK Delivery..
Own My Little Pony - Twilight and Starlight DVD from Deff, DVD, Blu-Ray & 4K Video Specialists - Free UK Delivery..
Own My Little Pony - Welcome To Ponyville / Call Of The Cutie DVD from Deff, DVD, Blu-Ray & 4K Video Specialists - Free UK Delivery..
Own My Little Pony - Welcome to Ponyville DVD from Deff, DVD, Blu-Ray & 4K Video Specialists - Free UK Delivery..
Own My Little Pony - Winter Wrap Up DVD from Deff, DVD, Blu-Ray & 4K Video Specialists - Free UK Delivery..
Own My Little Pony Blu-Ray from Deff, DVD, Blu-Ray & 4K Video Specialists - Free UK Delivery.. The complete Series 6 box set - over 9 hours long. Twilight Sparkle may be the smartest unicorn in Equestria, but there's more to life than learning magic. So Celestia sends her to Ponyville on a mission to make friends. There, she meets Rainbow Dash, Pinkie Pie, Applejack, Rarity and Fluttershy. In all their adventures together, the ponies learn important lessons about friendship, as they discover the friendship is the most powerful m..
Own My Little Pony Equestria Girls - Friendship Games DVD from Deff, DVD, Blu-Ray & 4K Video Specialists - Free UK Delivery..
Own My Little Pony Equestria Girls - The Movie DVD from Deff, DVD, Blu-Ray & 4K Video Specialists - Free UK Delivery..
Own My Little Pony Movie - Besties Mug from Deff, DVD, Blu-Ray & 4K Video Specialists - Free UK Delivery..
Own My Little Pony Movie - Faraway Adventures Mug from Deff, DVD, Blu-Ray & 4K Video Specialists - Free UK Delivery..
Own My Little Pony Movie - Make Waves Mug from Deff, DVD, Blu-Ray & 4K Video Specialists - Free UK Delivery..
Own My Little Pony Movie - Mane 6 Mug from Deff, DVD, Blu-Ray & 4K Video Specialists - Free UK Delivery..
Own My Little Pony Movie - Pony Tail Mug from Deff, DVD, Blu-Ray & 4K Video Specialists - Free UK Delivery..
Own My Little Pony Movie - Scribble Ponies Mug from Deff, DVD, Blu-Ray & 4K Video Specialists - Free UK Delivery..
Own My Little Pony Retro - Best Friends Mug from Deff, DVD, Blu-Ray & 4K Video Specialists - Free UK Delivery..
Own My Little Pony Retro - Made In The 80s Mug from Deff, DVD, Blu-Ray & 4K Video Specialists - Free UK Delivery..
Own My Little Pony Retro - Pony Dreams Mug from Deff, DVD, Blu-Ray & 4K Video Specialists - Free UK Delivery..